Military officers who are believed to have incited members of the special forces who marched to the prime minister’s office last Wednesday are in custody, said Ethiopian Defense Force chief of staff General Seare Mekonen as reported state media, Ethiopian Broadcasting Corporation. However, it is unclear as to how many military officers are arrested and what exactly was the level of involvement in terms of inciting army officers for protest. And there seem to be more officers to be arrested. 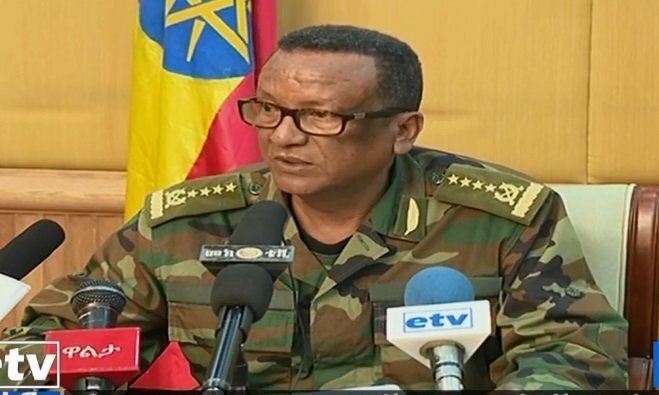 In a press conference held with local journalists, General Seare pointed out that the manner that some soldiers marched to the palace to raise benefits and other administrative issues was unconstitutional and out of military discipline that does not represent the Ethiopian Defense Force. The Chief of staff added that the soldiers could have presented their demands to concerned body within the chain rather than directly to the Prime Minister (Commander-in-Chief of the army). On the other hand, General Seare Mekonen, who seem to be articulate compared to his predecessor, Samora Yenus, went to a great length to give the public an image of professional, committed and disciplined arm that the Ethiopian Defense Force has. He said that the defense force has been competently defending the safety of citizens and was meticulous and effective in terms of conflicts in different parts of the country. He even hailed those members of special forces who marched to the prime minister’s office last Wednesday in terms of their competence. “They have been diligently accomplishing mission that they were given,” said General Seare Mekonen. The measures which governing is saying that it is taking against those behind the soldiers’ march to the palace are positively received by politicized Ethiopians. When the news of military anarchism spread across different platforms, Ethiopians from different walks of life took to social media to express concern that the incident represents bad precedent and that some thing worse could happen. Some even criticized Prime Minister Abiy Ahmed for treating the case very lightly ; he punished the soldiers a few set of push ups which actually made headlines for a different reason. After a meeting with the Chief of Staff, members of the special forces who violated the constitution and tarnished the image of the military issued a statement asking apology for the government and people of Ethiopia.